(Lincoln City, Oregon) – The central Oregon coast town of Lincoln City is gearing up for one of the year's largest festivals, but with an added twist. A huge array of glass floats will be appearing on the beaches as well. (Photo above courtesy Lincoln City Visitors Bureau). Uncover hidden treasures of all kinds during Antique Week, an eleven-day antique store sale extravaganza running February 5th through the 15th. Participating antique retailers will have special deals and discounts during the citywide event. Antique Week features over 100 antique dealers from nearly a dozen retailers in Lincoln City. One of the retailers, Rocking Horse Mall, recalls the history of the event. "Antique Week began back in the 1980s when my mother, Judy Miner, was approached by the Visitor and Convention Bureau to hold a shopping promotion in the winter," said Rick Miner, owner of Rocking Horse Mall. "Back then February was a slow month for retailers, so the idea was to bring visitors into town and boost their sales. The event has evolved since then, and has become very successful for not just the antique stores, but all of the businesses in Lincoln City." Another antique retailer in Lincoln City, The Little Antique Mall, has over 85 dealers and concurs with Miner on the importance of Antique Week. "February is our biggest sales month because of Antique Week," said owner Dan Beck. "We have visitors that call us wanting to know the dates for the event so they can book their hotels. Antique Week has really taken on a life of its own." Both Rocking Horse Mall and The Little Antique Mall will have special discounts during Antique Week. "Generally, most of our dealers will offer at least 20 percent off," said Beck. "But some have gone as high as 50 percent, so it really depends on the dealer." With a plethora of items to choose from, Beck recommends that collectors coming to Antique Week should plan a long stay. "Take your time," said Beck. "Plan on having enough time to browse through each antique store. Many of the stores in town will extend their hours to accommodate." Collectors can take advantage of deals and discounts during Antique Week while discovering treasures of all types. From art to books and furniture, Lincoln City has a variety of items to adorn your home. It is no wonder that Country Home Magazine once declared Lincoln City to be one the "Ten Best Undiscovered Antique Destinations in the Country." Then, in between shopping, treasure hunters can search for glass art on the beach during Antique Week. From February 5th through the 15th, there will be 300 antique Japanese glass floats carefully hidden during daylight hours between the high tide line and embankment on the beach. In days gone by, visitors searching Oregon's beaches often found treasures from the Far East: blown glass floats in intriguing shades of green and blue. Used by Japanese fishermen to float their nets, these spheres were as small as two inches or as large as two feet. They were collected, polished, and admired; the ultimate find for any dedicated beachcomber. For the romantics, on Valentine's Day, look for 14 heart-shaped paperweights, which will be lovingly placed along the seven miles of coastline in Lincoln City. These special glass drops are part of Lincoln City's popular Finders Keepers promotion. From mid-October through Memorial Day, secret volunteers called Float Fairies hide hand-made glass floats along the beach in Lincoln City. If you find one, you get to keep it. 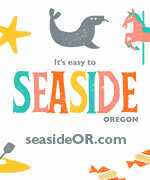 For more information about Antique Week or Finders Keepers, see www.oregoncoast.org or call 800-452-2151. More about Linconln City below and at the Lincoln City, Oregon Virtual Tour, Map.